MONTREAL–Vention, reported to offer the first digital manufacturing platform dedicated to machine design, recently launched the first public version of its free cloud-based 3D MachineBuilderTM and the securing of a $3.5 million CAD seed financing, led by White Star Capital alongside previous investors Bolt and Real Ventures. 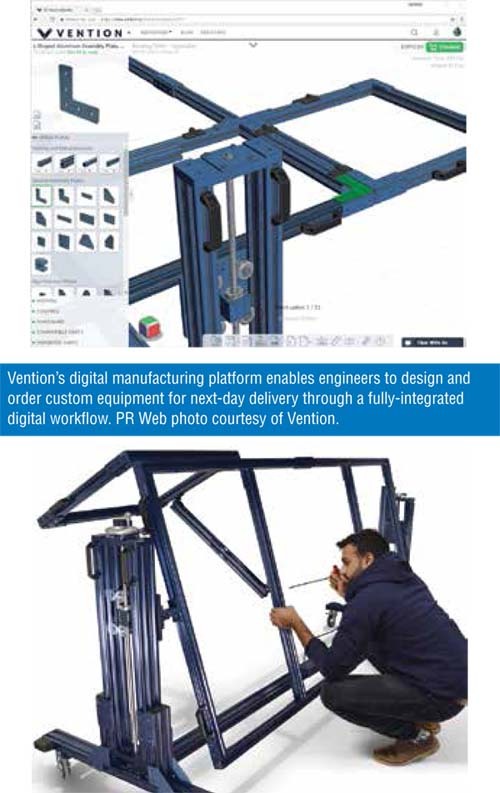 Vention's digital manufacturing platform enables engineers to design and order custom equipment for next-day delivery through a fully-integrated digital workflow. Traditionally, the "design-to-build" workflow for custom machines could take anywhere from four weeks to six months, depending on the complexity of the equipment. Vention's modular components and free Cloud-CAD enable the workflow to be completed in as little as three days, including next-day shipping across the U.S. and Canada. Vention is serving companies ranging from large automobile and aerospace companies to emerging robotics startups. The company also recently became the first and only design software and hardware platform certified by Universal Robots, the manufacturer of collaborative robots. "After 10 months of closed and open beta, Vention's digital manufacturing platform is ready for wider public access," said Vention CEO Etienne Lacroix, in a press release. "The transition from beta to first release, combined with the completion of a strong seed financing, will significantly accelerate our vision to become the world's most prominent machine design platform." Vention said that its beta program was successful on many fronts. Its platform was heavily tested by thousands of users, who used Vention 3D MachineBuilderTM for more than 15,000 hours and created more than 3,000 assemblies. Vention reportedly introduced 130 improvements in more than 25 platform updates, including full-fledged revision management, significantly improved "intelligent 3D constraints," and real-time prices and assembly time. The company also launched MachineMotionTM and MachineAppsTM, which Vention described as a first of its kind, all-in-one industrial motion controller that can be programmed directly from a web browser using a library of free "public apps" available on Vention.io. "Over the last 12 months, we established the foundation of a new category of CAD software. Our sole focus on machine design combined with tight hardware component integration enabled us to build an array of intelligent and automated features that could never have been possible with traditional CAD software. We are now entering a new phase of development with a greater focus on design automation, large assembly management, and In-CAD industrial automation," said Vention CTO Max Windisch, in the release. Access to the Vention web platform is completely free, with no limit on the amount of 3D designs that users can create. To experience the platform, potential users are invited to sign up for free on http://www.vention.io. With the completion of the $3.5 million seed financing, the startup is poised to significantly accelerate the development of its digital manufacturing platform on the hardware and software fronts. The seed round was led by transatlantic investor, White Star Capital, alongside existing investors Bolt and Real Ventures. Notable angel investors also include Jon Stevenson, CTO at Stratasys and former CTO at GrabCAD, Louis Tetu, current CEO at Coveo and former CEO at Taleo, and Rob Stevens, CRO at Tive and former vice president of sales and marketing at Kiva Systems. Vention was founded in 2016 by former mechanical and software engineers from General Electric, McKinsey & Co, Microsoft, VMware, and Pivotal. The company aims to become a central tool within the machine design ecosystem. To watch an introductory video about Vention digital manufacturing platform, visit www.vention.io/videos.